Sarah + Luke are officially husband and wife and we’re just SO excited to share their day with you! It was everything you think of when you picture a fall wedding. The girls started their day at Fringe Salon where Sarahs mama is a beautician. It was so awesome to see her mom get to play such a big role in her day, getting the girls all glammed up! After the salon we left for the hotel where everyone got dressed and made their finishing touches. Sarahs style is so unique and I was drooling over her details. Everything was just her. From her dress, her lipstick, the invitations and the rings, everything just totally fit. 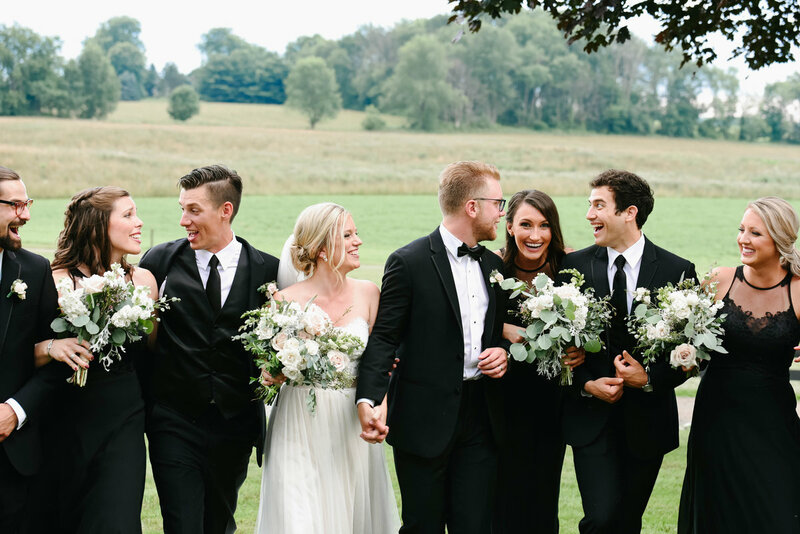 They saw each other for the first time outside of a little cabin on the grounds of Hale Farm and even though it was a little rainy, these two and their crew weren’t even phased. The clouds gave us the prettiest light and just wait until you see them in the pumpkin patch (!!!) An actual thunderstorm rolled in right before the ceremony so we quickly pulled all the chairs inside, but it was totally good because you know how we feel about a little rain on a wedding day. They had an intimate ceremony inside followed by horderves and dinner. Mini chicken + waffles for the win, y’all. We picked the best table to sit at and got to know a bunch of their friends over dinner. Their dance floor was totally packed all night long and it was one heck of a night to end our October weddings! Check out some of our favorites moments for their day! Sarah + Luke, we couldn’t be happier for you two. We wish you so much happiness. Congratulations! XO. Leave the newlyweds some love in the comments! If they recieve 20 comments on their post, they’ll get an enlargement of their favorite photos on us!